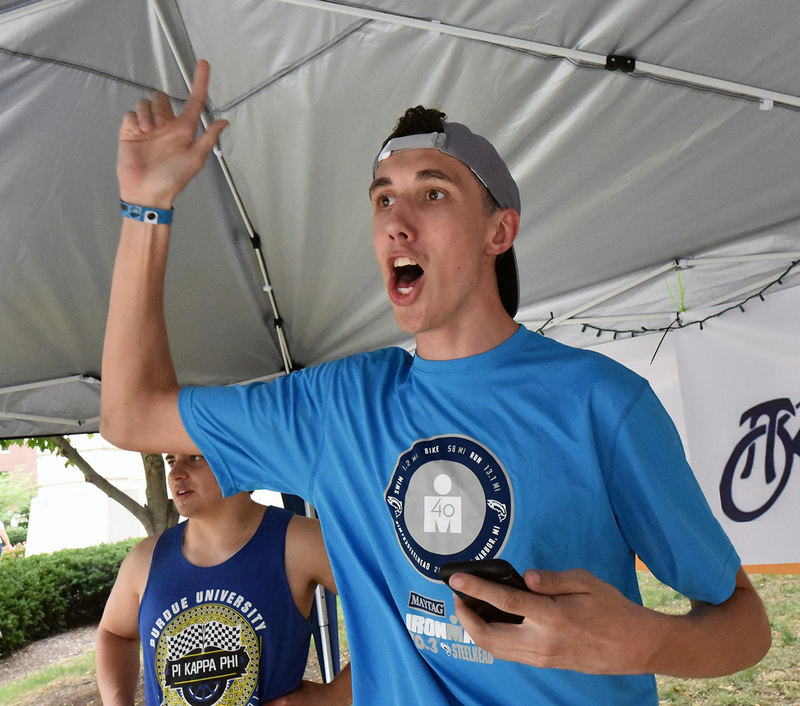 The Purdue Pi Kappa Phi members entered into their third day of the annual cycling event facing cooler weather and a lot of visitors at the belltower site. Five sorority teams competed for time and distance by the setting of the second full day of riding in the Eighth Annual David Feltner 72-Hour Memorial Bike a Thon. Also, Brandon Cutler, associate dean of students for fraternity, sorority and cooperative life, took his annual try at the bike. The efforts support people with disabilities and The Ability Experience, the national outreach for Pi Kappa Phi nationally. After mid-morning showers, chapter members did a simulcast Facebook Live feed with national fraternity staff members on Friday. While the heat was less, the humidity was out of control on Friday morning into the afternoon, but spirits remained high during the Eighth Annual David Feltner 72-Hour Memorial Bike a Thon. The annual event is being held at the belltower in the center of the Purdue campus. From noon to 1 p.m., Friday, the chapter broadcast live on its Facebook channel. During the hour-long broadcast, viewers got to watch chapter members on bikes, a class change and even the drive by the Boilermaker Special. Ability Experience CEO Basil Lyberg and Omega alumni and national staff member Brent Grunig conducted a virtual ride a long from Charlotte via Facebook Live, too. Still amid hot and humid weather, the annual bike a thon moved into its second 24-hour cycle on Thursday afternoon at the Purdue belltower. Sorority time and distance competition started on Wednesday with two Delta Delta Delta and one from Phi Sigma Rho. Four more teams will participate on Friday afternoon, too. One of the highlights of Friday’s events includes a noon to 1 p.m. dual Facebook Live options. Ability Experience CEO Basil Lyberg and chapter alumnus, now national staff member Brent Gruig will cycle at the fraternity’s national headquarters as part of the Purdue bike a thon. Simultaneously, the chapter will be broadcasting on Facebook Live at the same time, too. Furthermore, Brandon Cutler, associate dean of student for fraternity, sorority and cooperative life will take an hour long assignment at 3 p.m. The 72-hour ride to raise awareness and funds for people with disabilities will conclude at 5 p.m., Saturday, shortly after the Boston College at Purdue homecoming football game. A hot and humid late Wednesday afternoon greeted the first two riders of the Eighth Annual David Feltner 72-Hour Memorial Bike a Thon on the Purdue campus. Garrett Vinyard and Nick Ryan were the first two riders in the three-day continuous bike ride benefiting the Ability Experience, the national philanthropic effort supporting people with disabilities. It is held in memory of Feltner, who died of cancer in 2011 while an undergraduate chapter member. He was very involved in fraternity volunteer efforts with disabled while a Purdue student. As the 5 p.m. bells tolled, two riders faced 90 degree weather and 60 percent humidity. Two or three riders, as well as sorority timed distance competition will occur at the cycling site. In true Purdue form one of the first riders, Vinyard, was being quizzed on his flash cards for his Fundamentals of Biology test later in the evening. Chapter members assisted him and asking questions from his cards. Each rider is committed to raising at least $10 per hour riding. Alumni riders are welcome, too, as the event runs through the annual homecoming game on Saturday. The ride will conclude at 5 p.m., Saturday and then a celebration of the event will be held at the chapter house at 5:45 p.m.
Last year’s event raised $4,000 and chapter members have a head start on that fund-raising effort. On Monday and Tuesday, they participate in Pie a Pi Kapp that raised more than $600. Weather permitting, the chapter will be broadcasting on Facebook Live alongside Ability Experience CEO Basil Lyberg and national staff member and chapter alumnus Brent Grunig at noon on Friday. Lyberg and Grunig will broadcast live from Charlotte, NC, while chapter members will be doing the same at the cycling cite. The Purdue fraternity has raised $11,944 thus far in 2018, including $1,000 donations this week alone. For more information, contact chapter Ability Experience chairman Matt Zelinksi, zelinskimatt9@gmail.com, 937/475-2300. Over the first two days of Abilities Week for Purdue’s Pi Kappa Phi chapter, members took it in the face for charity. Passersby and predetermined attackers could make a pie consisting of various condiments – including whipped cream, syrup, ketchup, mustard and/or ranch dressing –for a donation to smear or throw the concoction in the face of a Pi Kappa Phi member or associate member. The two-day pie event raised $616 for The Ability Experience, the national fraternity’s outreach effort assisting people with disabilities. The Sept. 17-18 Pi a Pi Kapp was held at the belltower in the center of the Purdue University campus. It kicks a week of public fund-raising and awareness-building. At 5 p.m., Wednesday, the fraternity embarks on the Eighth Annual David Feltner 72-Hour Memorial Bike a Thon. The early part of the ride will occur outside Haas Hall, but will move to the belltower location after midnight, Wednesday, Sept. 19. Two or three bikes will be manned around the clock until 5 p.m., Saturday. Riders are committed to raising at least $10 per hour. The event will also include alumni who commit to $25 per hour to ride. Abilities Week is annually scheduled during Purdue’s homecoming week. The bike a thon is in memory of Feltner, who died in 2011 while a chapter member. He had a rare form of cancer. The proceeds go to The Ability Experience because Feltner was very committed to the chapter’s outreach program, both from service and fund-raising perspectives. Day 1 of Pi Kappa Phi’s Ability Week was marked with hot weather, high enthusiasm and some significant cash on Monday, Sept. 18. The chapter held “Pie a Pi Kapp,” whereby visitors to an area set up by the belltower in the middle of the Purdue campus make design their own “pie” made up of various condiments. Options included: Whipped cream, chocolate or caramel syrup, mustard, ketchup, relish, sugar sprinkles and/or ranch dressing. Oh, and since it was 90 degrees those options were sitting out in the hot sun, too. Three or more Pi Kapps – and two visitors who were not chapter members but wanted to pie each other for a donation – sat in chairs and allowed whomever smack or smear their “pies” into faces and/or hair. One condiment was $2 and additional ones were $1 each. There was a special of all them together for $10. A total of $390 was raised over a four-hour period with the proceeds going to The Ability Experience (www.abilityexperience.org), the national fraternity’s outreach program to assist people with disabilities. On Tuesday, Sept. 18, a second day of “Pie a Pi Kapp” will be held at the same location. Then at 5 p.m. Wednesday, the Eighth annual David Feltner 72-Hour Memorial Bike a thon will kick off outside Haas Hall. The bike a thon will move at 12:01 a.m., Thursday to its regular location next to the belltower. At least two stationary bikes will be manned for 72 straight hours, concluding at 5 p.m., Saturday. To donate to the chapter’s fund-raising efforts, you can make checks payable to The Ability Experience; c/o Pi Kappa Phi; PO Box 2700; West Lafayette, IN 47996-2700. The Purdue fraternity has raised more than $10,000 thus far during 2018 and would like to reach $20,000 this calendar year. For more information, contact Matt Zelinski, chapter Ability Experience chairman, at zelinskimatt9@gmail.com, 937/475-2300. For more information about homecoming, contact historian Gus Dunbar, historian@purduepikapps.com, 317/690-5643.